The most welcoming country in the world? “Welcome to Jordan, you’re most welcome to Jordan.” So began nearly every conversation in this beautiful, complex, fabulous country. Whether we were high up a rock in the desert of Wadi Rum or high up in a temple at Petra there was a universal smile and openness to the country that took me by surprise. I probably shouldn’t have been – you only need to spend ten minutes on their remarkable history to appreciate what an immense balancing act this small country pulls off. Sandwiched between Saudi Arabia, Israel, Iraq and Syria things could be so different. Instead of the history of turmoil that each of its neighbors has endured, Jordan has managed to remain peaceful, moderate and welcoming. Two thirds of the population are not native Jordanian – they have moved, migrated or sought asylum from one of the surrounding countries. Imagine that. Think of the fight we are picking in the UK over 3,000 children caught homeless in Europe right now. Jordan has not erupted, has not become extreme. It has recently shut its border with Syria but so have we, and we are quite some way removed. I learnt many things on my week trip. Many of the historical sites and stories blew me away – the huge scale of the remains at Jerash, the beauty of the red rocks in the desert, the wadi walks and most of all Petra – a place so unbelievable you cannot quite process everything you are seeing and feeling. But, what I did not expect to learn were two big lessons for life in the UK. The first was just how much value is now put on access to the Internet all over the world. After walking for seven hours from Dana village we spent a night at the Feynan Ecolodge – run by the local Bedouin community. There’s no electricity but there is wi-fi. The world seems to place a premium on technology that would have been unimaginable even a couple of years ago. It definitely made me re-energized for the @doteveryoneuk focus on bringing internet skills and services to everyone whoever and wherever they are. Secondly, as we stare down the barrel of a possible Brexit – think of Jordan. Their calm in the midst of so much chaos does us in the UK a great service. Their welcoming culture has helped one of the most toxic areas on the planet. I fervently believe that this is not the time for us to do the opposite and to become jingoistic. Our fortunes as humans have never been more linked – from climate change to technological change to war to movement of people. I hope we can be a Britain that defaults to “you’re most welcome”. Any chance you get, visit Jordan. Nearly 15% of their GDP is tourism and yet it’s collapsed in the last few years. They need us desperately and it is extremely safe. Please note that the link does not work. 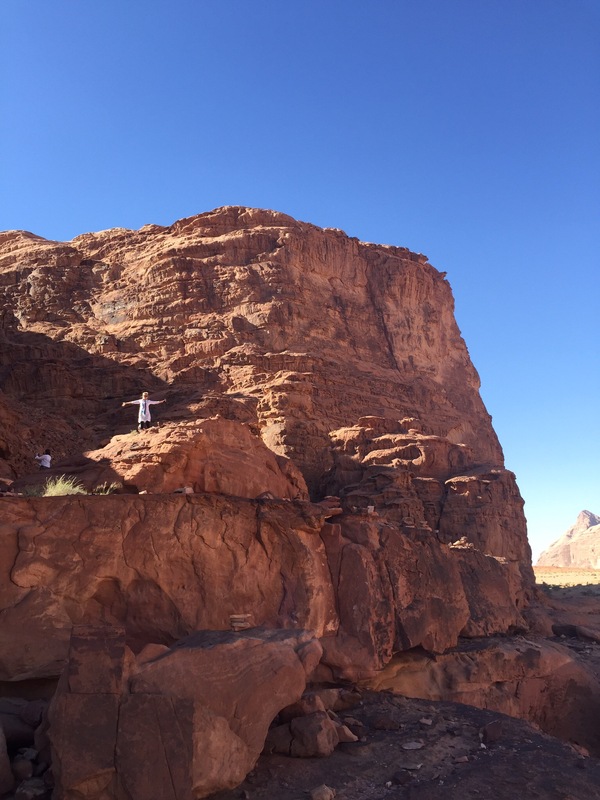 It is wonderful to read that you are doing well healthwise, and congratulations on finishing off one of the most demanding walks from Dana to Petra. Moreover, I am so glad you are had fun in Jordan and are helping my beloved Jordan. I am a student finishing off my degree in the UK, I have been here a while, and I must admit, I have truly felt the friendship of our countries on a daily basis, and the kindness of the people in the City I am studying in has been consistent and overwhelming. This friendship I am continuing did not begin with me, rather a long one that for me personally started three generations ago. Our friendship as a country today with yours, as many other friendships go through periods of ups and downs, sadness and happiness, joy and anger. For me, reading your article, I must admit, there is an element of disappointment. We cannot continue to talk about refugees, and continue asking the world for help when the sources of the help are not admitting the sources of the conflicts causing those refugees. Given the recently made drama of antisemitism in the Labour, I understand why you would not mention the term Palestine, the word Palestinian, or ever that they border us, and that their plight is at the height of our concerns and worries. My Lady, I am fully trans-Jordanian, I am one of the few people that make up our indigenous population. However, I do not see those who seek, sought or will seek refuge in my country as enemies, rather dear brethren in need, and I will assist them regardless. Nonetheless, I do have enemies, and my enemies are not only those causing those refugees to run away from their homes, but it is also those who do not admit their presence and their plight and go further and help prolong their plight, and their denial of Justice. The UK is not the empire it was, the repository of respect it has is being depleted, the repository you have within the heart of the average Jordanian is slowly getting replaced with anger, disappointments, and a lot of regrets. There are plenty of countries around the world filling in your shoes, from Scandanavia to East-Africa and all the way to Japan. One might be able to buy a last minute gift and bypass disaster. Nonetheless, one cannot create a last minute solution to evade disaster, the west-bank is moving towards that. I really do not want to have to give blood units, so the Jordan Armed Forces can replenish hospitals, such as what happened in Gaza in 2014. I hope you come more often, and wish all the best of health and success, in the house of lords and beyond.